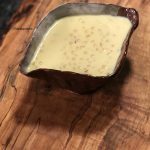 Pearl Couscous Kheer — Kitchenpostcards easy pudding any night! Kheer; a combination of rice, milk and sugar often flavoured with saffron, cardamom and garnished with nuts and raisins. This dessert brings together the most basic ingredients to create a satisfying and luscious dessert. Versions of it are made all over India and not surprisingly all cultures that use rice in their diet have also crafted similar dishes. 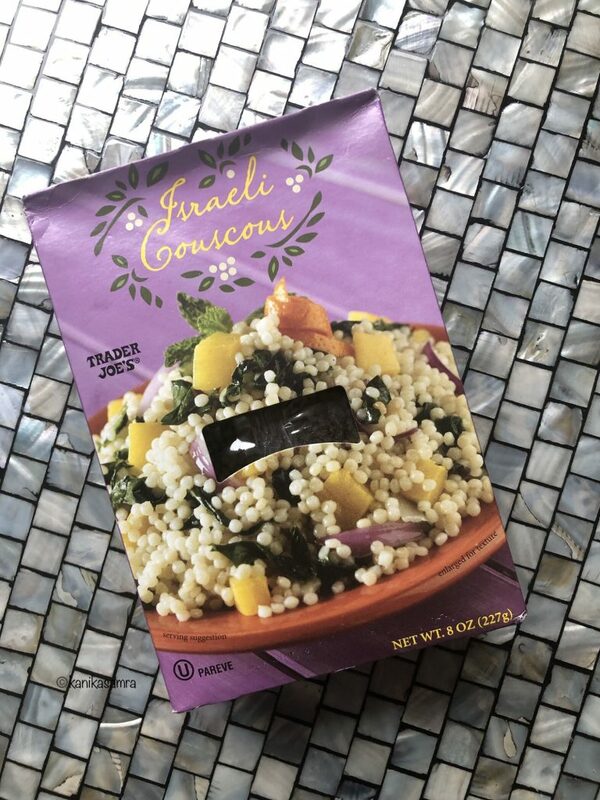 This recipe was improvised using a new ingredient – pearl couscous, also known as Israeli couscous. The pearl couscous kheer is quicker to make than traditional kheer and tastes just as good. Actually the pearl couscous kheer looks very similar to a common vrat (fasting) food – sabudana (tapioca pearls) kheer. 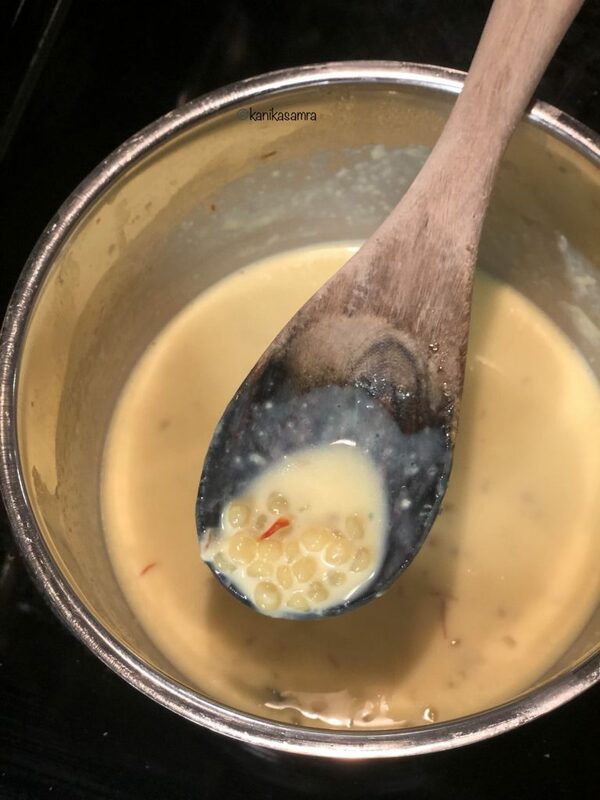 Hebbar’s Kitchen and Sharmi’s Passion have recipes for sabudana kheer, they also call it sabakki payasam or javvarisi payasam, that are essentially the same as my recipe. While sabudana is appropriate for fasts where cereals aren’t eaten, couscous is not appropriate for Navratri fasts because it is made out of a common cereal – wheat. The little that I gleaned from wikipedia (of course!) is that the pearl couscous or Israeli couscous is a pasta like product of wheat. A few slivered almonds, pistachios and cashews for garnish (optional). The proportions of this recipe are enough for serving two to three people; increase amounts as per your need. Start with collecting ingredients. 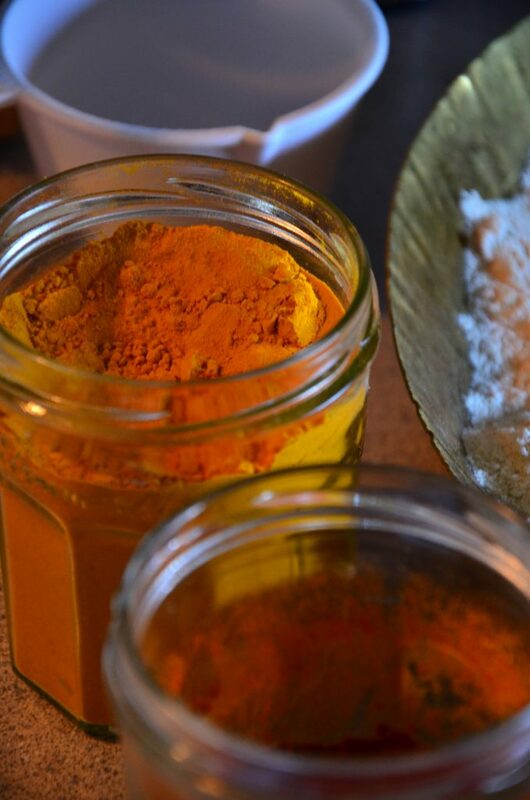 Pick out a few strands of saffron and take out cardamom pods. Measure milk, pearl couscous and sugar. Cardamom can be used in two ways, either by adding whole pods while boiling milk or using powdered cardamom instead. To make your own cardamom powder for this recipe shell two or three pods and collect the seeds. Then grind the seeds in a spice/coffee grinder. Use the shells for flavouring tea. Mix them in the loose leaf tea you use or boil cardamom shells in water before steeping tea in it. Strain before serving. First step after collecting all the ingredients is to heat milk along with saffron and cardamom in a thick bottomed pan. Bring it to a boil, approximately 7-10 minutes, on medium heat and stir occasionally to avoid it from sticking to the bottom and the formation of a skin on the top. Saffron will lend it a pale yellow color that will deepen with time and the cardamom should become fragrant within minutes. Fluffed up and almost done pearl couscous. Next, add pearl couscous and cook until fluffy and almost double in volume, about 10 minutes. Since it is essentially a dried wheat pasta you will notice that it absorbs moisture quickly. Continue to simmer in milk for another 5 minutes. Add sugar and mix until dissolved. Turn off the heat. The kheer is ready. You could serve it warm right away or cool it to room temperature and then chill in fridge. Garnish with slivered nuts. It will keep in the refrigerator for upto 3 days, but I doubt you’ll have any left once its served. I made it on a whim one winter evening and we licked our bowls clean! Pearl Couscous Kheer ready to serve! 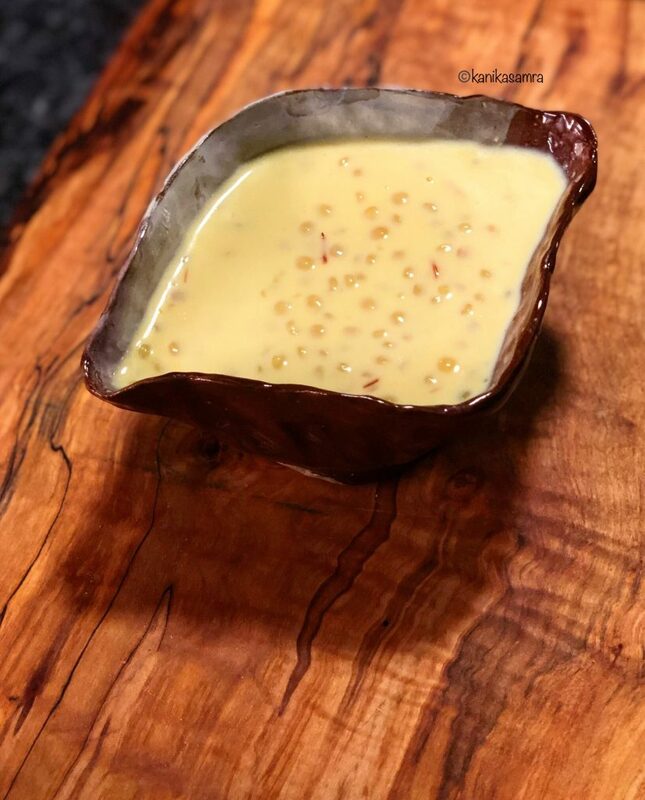 Pearl Couscous Kheer – an instant(ish) pudding for all nights of the week! Pearl couscous is strikingly similar to sabudana. This dried, dense pasta from Israel makes a delicious kheer that is quick and easy for all nights of the week. Try it today! Pick out a few strands of saffron and take out cardamom pods. Measure milk, pearl couscous and sugar. First step after collecting all the ingredients is to heat milk along with saffron and cardamom in a thick bottomed pan. 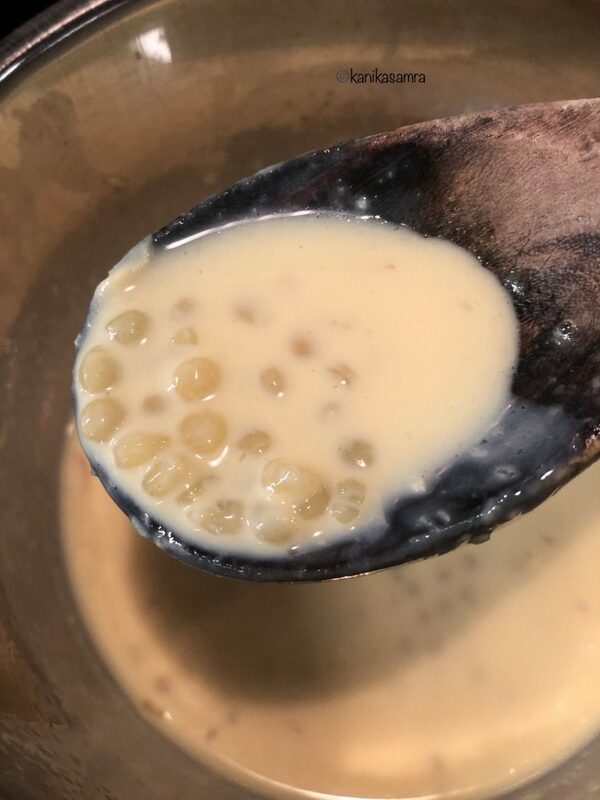 Bring it to a boil, approximately 7-10 minutes, on medium heat and stir occasionally to avoid it from sticking to the bottom and to avoid the formation of a skin on the top. Next, add pearl couscous and cook until fluffy and almost double in volume, about 10 minutes. Continue to simmer in milk for another 5 minutes. Garnish with slivered almonds, pistachio and cashew nuts (optional). Cardamom can be used in two ways, either by adding whole pods while boiling milk or using powdered cardamom instead. To make your own cardamom powder for this recipe, shell two or three pods and collect the seeds. Then grind the seeds in a spice/coffee blender. Use the shells for flavouring tea. Mix them in the loose leaf tea you use or boil cardamom shells in water before steeping tea in it. Strain before serving.